Much like his new teammate Carter (who registered four shots on goal in his L.A. debut) posted a hat-trick shortly before he was traded, against the San Jose Sharks, Brown showed why he might be a keeper or a nice addition for a contending club. Clearly the Kings had a new pep to their step and were sharp (and I ain’t talking Patrick) in every facet, while hosting Chicago. Midway through the first frame and on the power-play, Brown took a nice drop pass from Jarret Stoll and beat Corey Crawford for a 1-0 lead. Later in the period and again with the extra attacker, Brown cashed in on a rebound, off an Alec Martinez blast from the point. 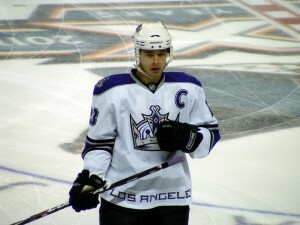 Stoll also chipped in with a secondary assist and the Kings doubled their advantage. You know things are going especially good for the Kings when the power play is rocking. Yet the defensive oriented Kings also know how to get it done on the PK too. In the second and on the penalty kill, Brown would force a turnover in the neutral zone and flip the puck out to Willie Mitchell. Mitchell then promptly rewarded Brown, feeding him for a break and Brown had himself a shorty and a hat-trick. It was Brown’s 17th marker of the campaign. On the game, L.A. held Chicago to a whopping 0-for-6 on the power-play. Shortly thereafter, that combo would strike again. Mitchell, whom the Kings rewarded with a two-year deal, reciprocated by taking a pass from Brown and bombed one home from the point, for his fourth of the season. Four goals, 4-0. While the Kings surged on offense, they were equally stout on the defensive end. In addition to holding the high octane Hawks scoreless on the power-play, Los Angeles did not yield more than nine shots in a given period. In all the Kings held the Blackhawks to 19 shots and Chicago only got off four shots during the third period. Quite impressive. 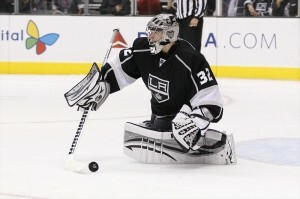 Plus when one has one of the best dust busters of the game in goal with Jonathan Quick, it makes for smooth sailing. Granted he only faced 19 shots, but give Quick four relatively early goals and his confidence is going to skyrocket because he’s finally getting some major support. For Quick, he recorded his seventh shutout of the year and the 21st of his career. As for Brown, the man who now has the last two hat-trick’s at Staples Center, sometimes the best trades are the one’s you don’t make.